"All work and no play makes Jack a dull boy." Many in the corporate world can certainly relate with this statement, and equally empathize with their employees. While we all strive to increase our company's profitability and performance, we also need some quality recreation and relaxation! Sometimes, the best thing to do is get away! 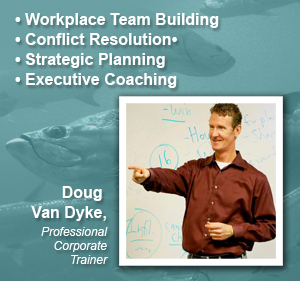 Gulf Coast Charter Brokers (GCCB) has partnered with a leader in corporate development, Doug Van Dyke of Leadership Simplified, to offer Corporate Enhancement Seminars paired with World-Class Fishing Charters! Make the Gulf Coast of Florida your destination for professional corporate training! Customized workshops are available in Boca Grande, Englewood, and Venice, Florida where the area is renown for its beautiful beaches, resort atmosphere, and excellent fishing! Doug Van Dyke has consulted business professionals for over 20 years with an emphasis on leadership, collaboration, and strategic planning. Mr. Van Dyke, and his company Leadership Simplified, has worked with small, medium, and Fortune 500 companies across the nation to increase production, profitability, and customer satisfaction. Through a process of evaluation and discovery, Doug Van Dyke will work with your team to develop a sense of unity, define clear goals, implement a measurable plan for defining success, and learn better communication skills. Workshops are held in facilities in the aforementioned locations of Boca Grande, Englewood, and Venice, FL. The workshops are held indoors with Charter fishing trips scheduled after the workshops or on the following day. Contact Gulf Coast Charter Brokers to schedule your Corporate Retreat! 941-405-FISH! If you will provide us with the following information, we will work with you to coordinate your workshop facilitator and your charter fishing Captains. GCCB can also assist you with accommodations as we work with several local Rental/Real Estate agencies and accommodation providers. Please check with your CPA regarding the qualifications for a tax deduction for business expenses such as training and entertainment. *Content subject to change. *Rules/Code for US IRS deductions subject to change. DO NOT use the information below without first consulting with a Certified Public Accountant and/or the United States IRS for the most current tax information. "Education expenses. Ordinary and necessary expenses paid for the cost of the education and training of your employees are deductible. See Education Expenses in chapter 2. You can also deduct the cost of your own education (including certain related travel) related to your trade or business. You must be able to show the education maintains or improves skills required in your trade or business, or that it is required by law or regulations, for keeping your license to practice, status, or job. For example, an attorney can deduct the cost of attending Continuing Legal Education (CLE) classes that are required by the state bar association to maintain his or her license to practice law. Education expenses you incur to meet the minimum requirements of your present trade or business, or those that qualify you for a new trade or business, are not deductible. This is true even if the education maintains or improves skills presently required in your business. For more information on education expenses, see Publication 970." "Director, stockholder, or employee meet-ings. You can deduct entertainment expenses directly related to business meetings of your employees, partners, stockholders, agents, or directors. You can provide some minor social activities, but the main purpose of the meeting must be your company's business. These expenses are subject to the 50% limit."